If you haven’t looked at your plan in more than six months, then you’re overdue. When people build a financial plan, they spend a lot of time thinking about their goals and sitting with a financial advisor to find out the best way to achieve them. But what happens once the portfolio is created and the investments are in place? Is it time to go on automatic pilot? In a world with volatile markets and changing personal circumstances, autopilot isn’t a smart idea. If you just leave your pieces (i.e., your investments) alone, they may not perform at their best. But if you periodically review your portfolio’s composition, and make sure all is following your financial plan, you can help your money be more effective. It is a good idea to review your finances twice a year, and more if you undergo significant life change such as marriage, divorce, having children, or a career change. As your life circumstances change, so do your needs and levels of risk. 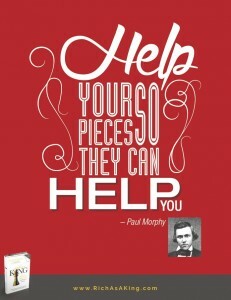 Download the Rich As A King poster book for inspirational reminders to help your pieces help you! Although the price of the book is $9.99, we are presently giving it away for free. So hurry up and download your copy while it’s still free.